What publication do you read for in-depth coverage of the Super Bowl? Sports Illustrated or ESPN online, perhaps? If the National Football League has its way, your future choice will be NFL magazine, a recently launched publication covering all things NFL. By issuing its own official magazine, the NFL becomes the latest high-profile brand turned publisher. NFL magazine faces some obstacles, one of which is sports media saturation and a low profile in the digital world. The publication can succeed by becoming more digitally savvy and catering to content-hungry fantasy football enthusiasts. The NFL is not alone in publishing branded content. 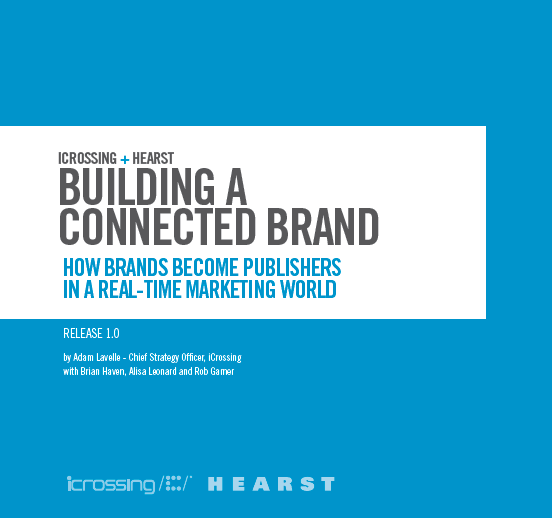 Last year my employer iCrossing issued an in-depth report on how brands ranging from Kraft to Ally Bank have been building audience relationships by publishing useful ideas and content, even hiring editors and writers and creating publishing schedules. And a 2011 Roper Study indicated that 90 percent of CMOs across the board value branded content. In many ways, the pressure to remain engaged with content-hungry consumers empowered by social media has pressured brands to become publishers, as Forrester Research reports. NFL magazine, published in both print and digital editions, promises “the ultimate press pass for the NFL Fan” just as L’Oreal acts as the ultimate guide to personal care with its Makeup site. In a nod to the power of social media, a magazine advertisement asks, “Got 10 seconds for the NFL? Read a tweet. Need more than that? Sign up to receive the new NFL magazine.” Its February issue features an exclusive interview with controversial Detroit Lions defensive tackle Ndamukong Suh, a profile of Green Bay Packers star quarterback Aaron Rodgers, and an inside look at the NFL Officiating Command Center. Its marketing strategy includes an obvious promotion on the NFL website (where I learned about the magazine while trolling for Super Bowl content), a Facebook page that is posting frequent content about Super Bowl XLVI, and a Twitter account that appears to be doing double duty as a source of promotion and customer service. The magazine’s content distribution approach includes versions optimized for the iPad, iPhone, and Android. Although making content available on different digital platforms is smart, I believe NFL magazine is overlooking an opportunity to draw readers by making some of its content available for free online, for reasons I discuss later in this post. The new publication has some pre-built advantages over other sports publications, most important of which is the powerful reach of the NFL brand. The NFL is one of America’s best-run businesses in the eyes of BusinessWeek, and it did not seem like an exaggeration when marketing pundit TalentZoo recently asked, “Is the NFL Brand Indestructible?” According to Forbes, the average NFL team is worth $1.04 billion. The NFL seeks to become a $25 billion brand by 2027, a realistic goal given the lucrative broadcast revenues the league commands alone. Media saturation. The magazine is taking on well-entrenched sources of sports content, such as Yahoo! Sports, ESPN, Sports Illustrated, and Deadspin. And all those publications offer a great deal of free content online. So far, NFL magazine offers nothing free online. And that’s a major problem for an upstart looking for an audience. Credibility. The NFL, sometimes referred to as the No Fun League, has a well-deserved reputation as a controlling organization with a bland, corporate personality. (And as you can see from the NFL identity guidelines, the NFL takes its brand seriously.) 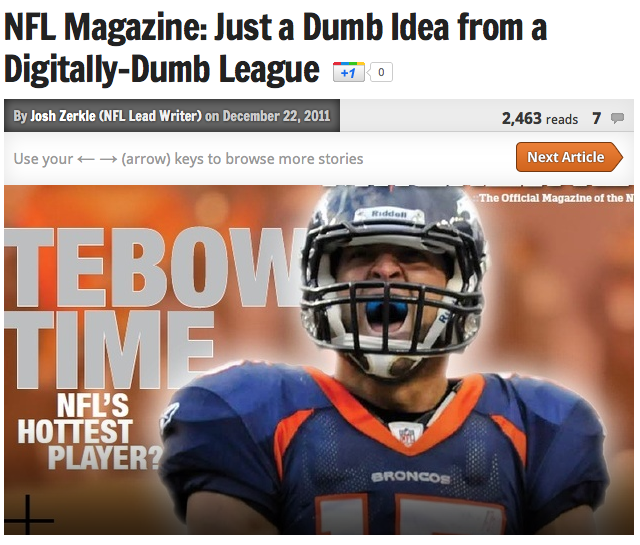 How in-depth and insightful can we expect the NFL magazine to be in covering itself? Moreover, fan loyalty lies with individual teams and players – not with the league as an entity. Cowboy fans attend games to see the Cowboys and to enjoy the state-of-the-art stadium built by the team’s owner, Jerry Jones. Chicago Bears fans love the Bears and don’t care to read about the success of Aaron Rodgers of the Green Bay Packers — and vice versa. Zerkle has a point although I would not go so far as to call the NFL digitally dumb: the NFL earned more money from digital ($500 million) in 2010 than any other sports league in the United States, according to eMarketer. 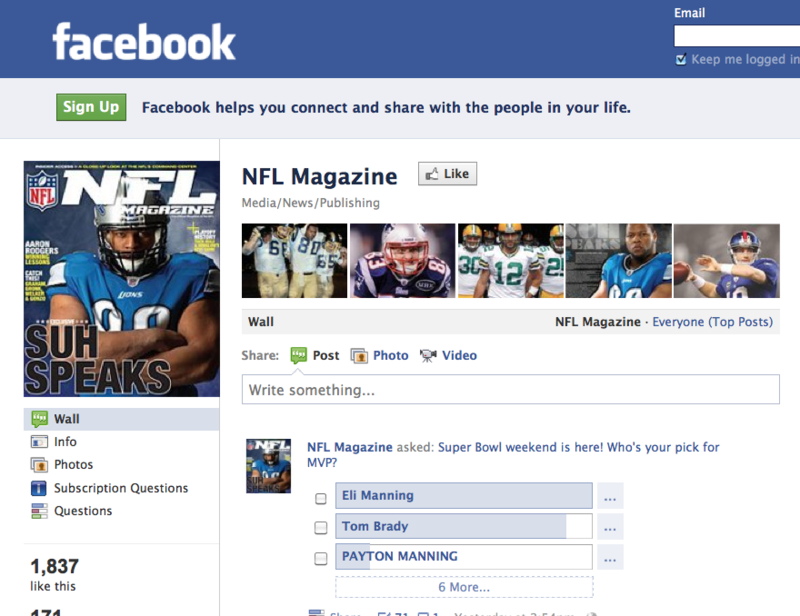 But NFL magazine should do a better job marketing the digital formats of the magazine. Frankly, as an upstart publication, NFL magazine should make some of its articles available free online, especially to let skeptics like me judge the quality of its content. So far, the online destination gives you nothing but instructions for ordering the print magazine. 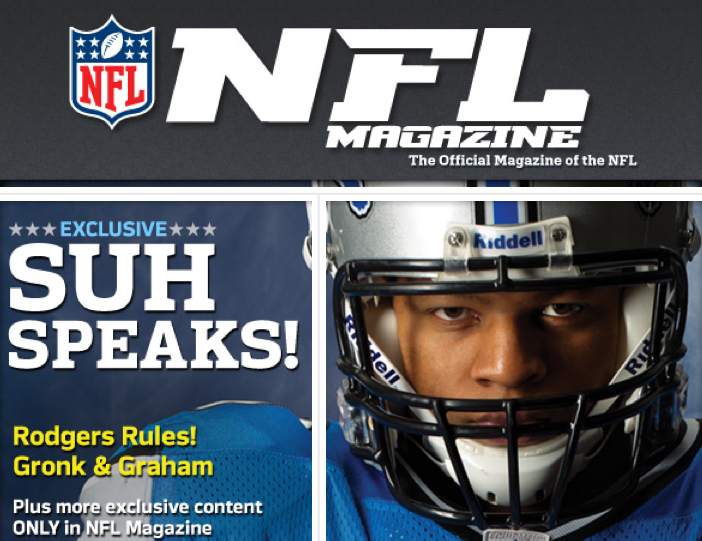 NFL magazine has a golden opportunity to address doubters by making the interview with Ndamukong Suh available free online. Suh is a troubled defensive tackle, whom the NFL suspended for two games without pay in 2011 for unnecessary roughness in a Thanksgiving Day game against the Green Bay Packers. I learned about the interview on a cold Saturday evening in February while curled up with my laptop in my warm and cozy family room. My “zero moment of truth” — my decision to learn more about the magazine and the article — occurred in my home, where I consume most of my content, not in a bookstore or at a newsstand. NFL magazine should be courting me during my zero moment of truth, rather than hope I will remember to seek out the magazine next time I’m passing a magazine rack at Chicago’s Union Station during my commute to the office two days from Saturday. On top of that, I’m already inclined to read sports content from ESPN or Sports Illustrated, whom I trust for even-handed coverage more than the NFL. Am I being fair to NFL magazine by pre-judging the Suh article? Probably not. But this post is about the reality of how a potential consumer thinks, reacts, and decides (fairly or not), in a world where good-quality digital content competes for our attention online every hour of every day. Moreover, how will the NFL will figure out the balance of offering useful information on the already well-established free NFL.com website and a subscription-only magazine? The magazine can succeed by courting dedicated fantasy football players who have made fantasy football a billion-dollar business. According to the Los Angeles Times, some 29 million Americans compete in make-believe football leagues, assembling pseudo teams whose success or failure hinges on the weekly performance of real-life NFL players during a regular season. As the L.A. Times reports, fantasy football enthusiasts, who famously track the careers and statistical value of players and teams, have boosted TV ratings of the real-life NFL and contributed to the overall financial growth of the league. The popularity of fantasy football helped fuel a lucrative arrangement between the NFL and Sprint (which makes it easier for fantasy football enthusiasts to monitor player performances on their mobile phones). The NFL could make its magazine an indispensible source of in-depth data by giving fantasy football fans an interactive way to experience the vicarious thrill of operating a team during the season and throughout the off-season. But NFL magazine has a lot of work to do to get there. This entry was posted in Digital, Entertainment, Marketing, Twitter and tagged Aaron Rodgers, Ally Bank, Android, Bleacher Report, Chicago Bears, Dallas Cowboys, David Deal, Deadspin, eMarketer, ESPN, Fantasy Football, Forrester Research, Green Bay Packers, iCrossing, iPad, iPhone, L'Oreal, Ndamukong Suh, NFL, NFL magazine, Roper, Sports Illustrated, Super Bowl, Superhype, Yahoo! Sports. Bookmark the permalink.